Jack: "Why would anyone jump out of a perfectly good airplane?" Greg: " 'cause the door's open!" This all happened in September of 1998 when my wife, Linda, and I were in Tucson for a convention. We went out several days early for some R&R and Linda noticed an ad for Skydive Marana in one of those magazines in the room. I called for information and leaned that I had two options. The first was a static line jump. For that one, I'd have to take 4 hours of instruction which were given at one fixed time each day. The advantage was that it'd be a solo jump; the disadvantages that there would be no freefall and I'd give up 4 hours of pool time. 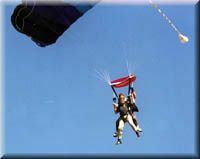 The second option was a tandem jump where I'd be tied to another jumper who would be the one wearing the 'chute. It wouldn't be solo but we'd freefall and only a few minutes of instruction would be needed and it could be scheduled at my convenience. The cost of either option was $105. I decided tandem was the better option for me. The conference started on Thursday and I procrastinated all through Wednesday so I figured that was that. As luck would have it, the keynote speaker Thursday morning spoke on taking risks. He said he'd decided if he was going to go around the country preaching about taking risks, he'd better practice it himself. 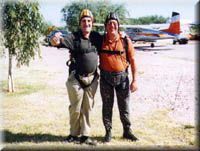 His own greatest fear was of heights so he'd decided to jump from a plane. He'd had the whole thing documented and showed the film as part of his presentation. Well, that did it; I figured it was fate! After the session, I called Marana to make an appointment for Saturday. That evening, we had dinner with our very good friends Karl and Gisele from Germany and Karl showed a keen interest. The next day, I called Marana again to add Karl to the schedule. Well, Saturday finally arrived and the four of us set off for Avra Valley Airport, northwest of Tucson. We were greeted warmly by Jennifer upon our arrival and we had to sign several documents to give away any rights to sue Marana if things didn't work out well. (Read: we end up as part of the desert landscape.) That out of the way, we were taken into a back room to watch a video designed to inform us about what to expect from a tandem jump and to make it crystal clear that we really were putting life and limb into serious jeopardy. They even worked in a picture of an ambulance for extra impact (excuse the expression!) Then we got to sign even more documents! These guys apparently have lawyers who are super cautious. Basically, the message was, "If you splat, tough luck!" Between name and initials, I'll bet I made my mark 25-30 times; it was like buying a house! Of course, we paid the bill before we went any further; no fools, these people! We had to remove everything from our pockets and give it to the girls. Whether that was for our safety or that of the people on the ground is anyone's guess. Finally, the technicalities were taken care of and we got to make total fools of ourselves by donning a ridiculous costume of pointed leather helmet, goggles, harness and, for me (since I was wearing shorts), jump pants in a bizarre print. As to the rig, neither Karl nor I would be wearing a 'chute. Our harnesses each had 4 snaps on the back, two at the shoulders and two at the waist. Zack and Greg, the jump masters, had complimentary snaps on the front of their harnesses but theirs were lower so basically, they'd be looking over our heads. The upper snaps take the load (we were told that they're rated at 5000# each) and the bottom ones just keep our bodies from slamming around. The girls were in stitches when they saw us and I'm including the photo only with great reservation. After the photo-op, it was time to take off. Each of us had our own jump partner, of course. Karl's was Zack and mine was Greg. The four of us walked out to N8813T, a very stripped Cessna 182 where Karl and I were given final (scary word!) instructions on how to exit the plane and what to do after that. The drill was that we'd position ourselves in the door with our left knee on the sill and our right foot out on the wheel strut. My (or Karl's) foot would be on the step and the instructors would be above it on the strut. we were to cross our hands over our chests until we were out, then when we felt him hit our shoulders, we were to make like Superman. The plane had virtually nothing in it but the pilot's seat. All the other seats had been removed as had all the cabin lining. Each of us strapped in sitting on the floor. Karl was on the floor to the right of the pilot, Zack was behind him and Greg was behind him. All three were facing forward. I was facing aft leaning on the back of the pilot's seat. Off we went in a roar compounded by the lack of any insulation. The ride up was very pleasant and I enjoyed looking around at the beautiful Sonoran Desert. My only real regret was that I couldn't watch the instruments to see how things were progressing. However, I was in a great position to converse with Zack and Greg and I could keep track of altitude by looking at the instrument on Zack's wrist. The interesting thing to me was how totally calm I was on the way up. Occasionally I'd ask myself why I was doing this but I'm certain my pulse and blood pressure were quite normal. Basically, I was just sitting there chatting and looking around. It turns out but Zack and Greg are also private pilots so we mostly talked about flying. Somewhere along the line, I repeated the classic pilot's question about skydiving and got the answer that's at the top of the page. I guess that's as good an answer as any. In climbing, we basically circled the airport and with a temperature approaching 100F, it took quite a while. Our jump altitude was 9500' AGL ("above ground level" for you non-pilots) or 11500' MSL (above sea level). Eventually we got there and started getting ready to go. Karl and Zack got on their knees and Zack buckled himself to Karl's back. That done, the door was opened and my heart started to pound. The realization that I was about to do something incredibly stupid finally hit me! Karl and Zack got ready and suddenly they were gone! I don't remember even seeing them go. OK, my turn... this is really dumb! I buckled my helmet, adjusted my goggles and got hooked up to Greg. Words like terror fall far short of describing my emotions as I got up near the door and put my foot into the slipstream. I've been flying for a couple of years now and, while it was never explicitly mentioned in training, it's always seemed prudent to stay inside the airplane! Greg leaned forward and told me to cross my arms and hang onto the harness straps. As I looked back over my shoulder to ask, "Like this? ", he ripped me out of the plane and we started tumbling! Lord, what terror!!! That was weeks ago and I'm still scared when I think of it! We probably somersaulted only once or twice but it seemed forever. Suddenly, I got the rap on the shoulders, threw my arms out and we were horizontal and roaring through the air. There's no describing it. It didn't feel like falling but the wind was screaming and the stuff on the ground was definitely getting bigger! After what seemed like a year (but was actually about 40-50 seconds), there was a sudden noise and sharp jerk as the 'chute opened. The wind stopped and all was quiet. Greg told me to put my goggles up on my helmet so I could see better, then he handed me the ends of the control lines so I could steer. He showed me how pulling down on the left line turns us left while the right line turns us right. Then he pulled down hard on the right one and we spun violently to the right. That was unfortunate because my stomach doesn't like that sort of abuse and it was upset until long after we landed. Really amazing how he could control the 'chute like a glider. All the time I could watch the airplane traffic at the airport and I thought of the many times the roles were reversed with me looking for the jumpers and joking about how a skydiver can really mess up the windshield. We watched Karl land and suddenly it was our turn. Greg pointed out the windsock and flew a normal (but tight) left traffic pattern; downwind, base, and final, landing us right on target. Just before hitting, we both pulled hard on the lines to flare and virtually arrested our descent. He'd said we'd probably land on our butts and that we did, hitting the gravel of the target. Gravel flew everywhere (several tons ending up in my boots) but the landing was little harder than sitting on the couch. Karl, unfortunately, hit the grass instead of the gravel and hurt his tailbone which was sore for over a week. What A kick!! We stripped off the clown suits, were given certificates (of lunacy, I guess) and headed for the hotel and its pool bar. A couple of Margaritas and about four hours later, my adrenaline got back to something like normal. Am I overly eager to do it again? No. Would I under the right circumstances? Yep. My only real regret is that the stomach thing took my attention and I never asked to try to steer the thing myself. I'd have liked that and that's the thing that might take me back up.